Yoann Sanson was born in France in 1980. His musical studies take place at the Conservatories of Clermont-Ferrand, Toulouse and the University Toulouse Le Mirail. After a degree in Musicology and Trumpet in 2002, he took Bertrand Dubedout's electroacoustic composition lessons and get the CFEM in 2005. Since then, he composes instrumental, mixed and electroacoustic music, and likes to share it with the image and the performing arts. His music is sometimes awarded (Presque Rien Prize in 2017, IMEB Bourges Contest in 2007). He also plays live on electronic devices (Karoshi - with Sylvain Darrifourcq) and realizes audio-visual installations (Sound of nothing # ... - with Benoît Dhennin). 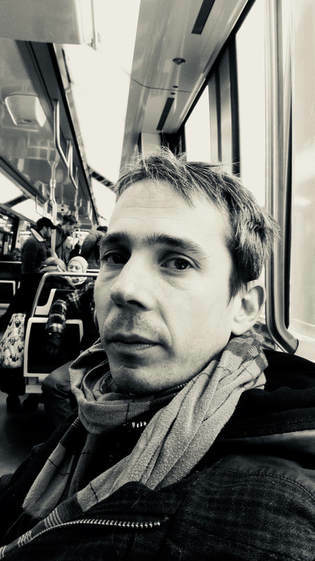 He currently works as a composer for the companies Athra & Cie (theater), Vilcanota (dance) and as technical manager for the contemporary music structure of Clermont-Ferrand Musiques Démesurées. His music is mainly played in Europe and North America. « My work of music has become something very concrete, as responding to primary functions. Fervent follower of reduced listening, I like to think that music is intimately linked to the contexts in which we compose it and we receive it. How is a work written in the heart of winter listened to in an outdoor summer festival ? I favour the sound recording as an element of musical writing, playing with its anecdotal telling as its purely sound qualities (textures, complexities, profiles). Thus I take from the vibratory air fragments of sound that I make transformed to the Universe, as the mechanism of inspiration / expiration.